My sister just facebook'd me this photo and i had to share it with you all!. My sister left for London early this mornning. In fact i walked in around 2.30am and she got up around 3am to get ready to leave! She's on holidays visiting our family in nottingham as well. But they arrived in London just a couple of hours ago and knowing my sister Sarah.. She doesnt waste any time so she's probably getting my list sorted out and will be all bought by tonight! 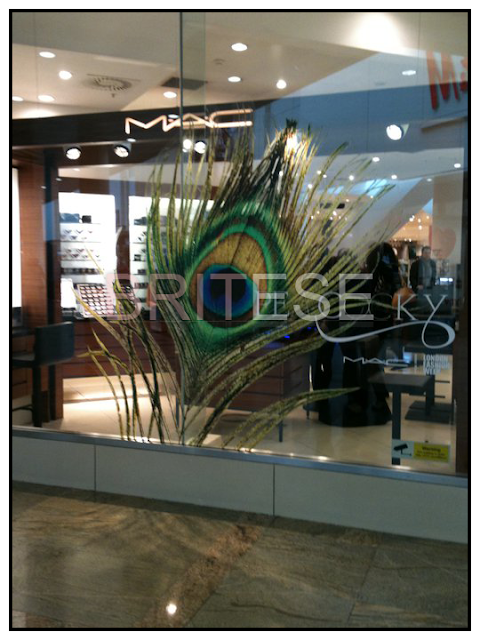 But thats just a sneak peak of the window visuals of MAC in London showcasing the Peacocky Collection!